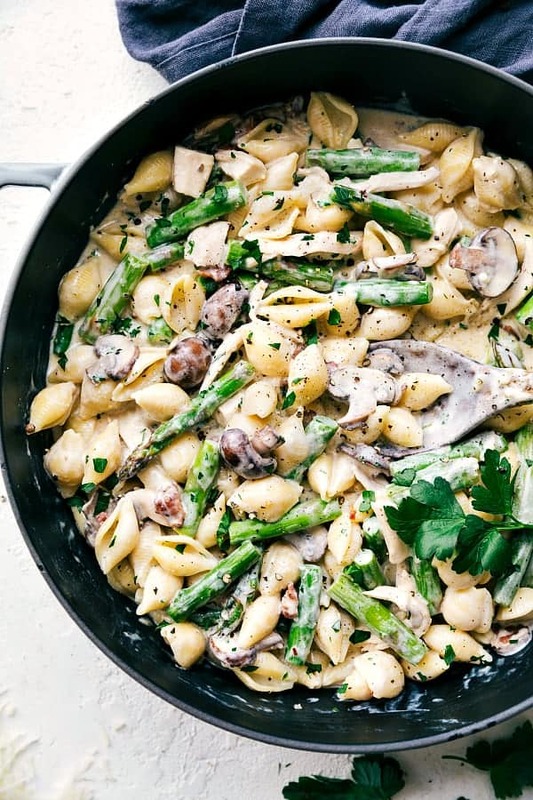 Cheesy Chicken, Asparagus, Bacon, and Mushroom Shells are made in one pan with an incredibly creamy white cheese sauce. This is a quick and easy meal that will become a new family favorite! I don’t know about you guys but I am all about the family friendly meals lately. Life is just always on the go, so I feel like I am winning at life when I bring the family together at the dinner table. This entire meal is made in one pan. One pan meals are awesome because it requires hardly any clean up at all! This meal comes together in less than 30 minutes and I promise you it will be one of the best meals that you ever make. 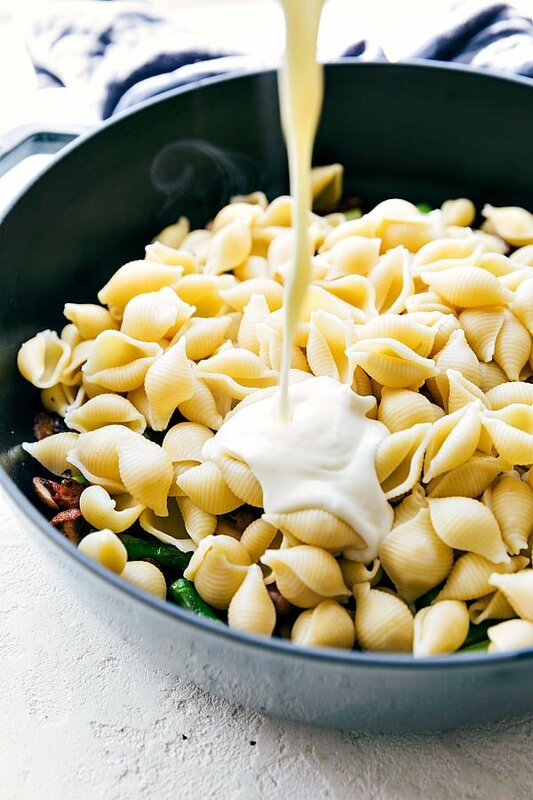 This creamy white cheese sauce is going to knock your socks off. 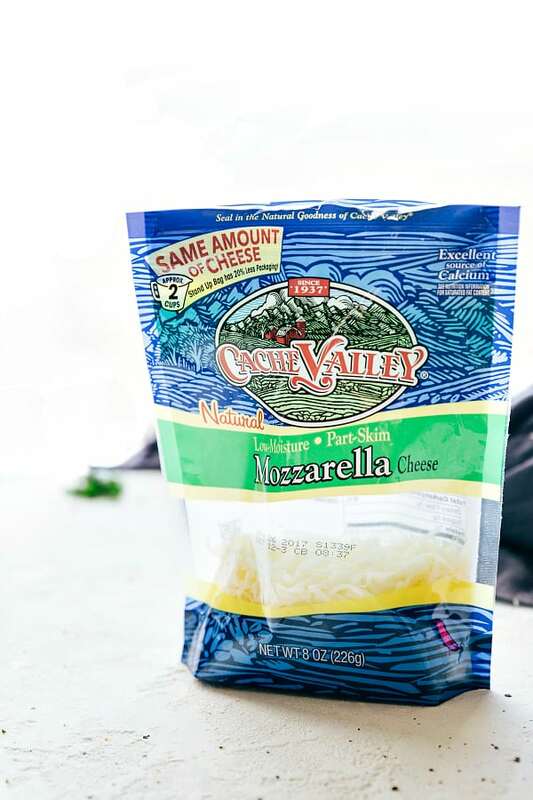 It is made with Cache Valley Cheese. They are dedicated to quality so you can fully expect expertly crafted cheese every single time you use it. For over 75 years they have been producing flavorful and rich cheese that I know that I can trust in making my recipes delicious! I always keep Cache Valley Cheese on hand at my house and wouldn’t ever want to go without it. Cache Valley is a local to me here in Utah. You guys know I love local and my cheese preferences are no exception. Cache Valley is a hidden gem to us. The great thing about this recipe is that it is a meal in one! 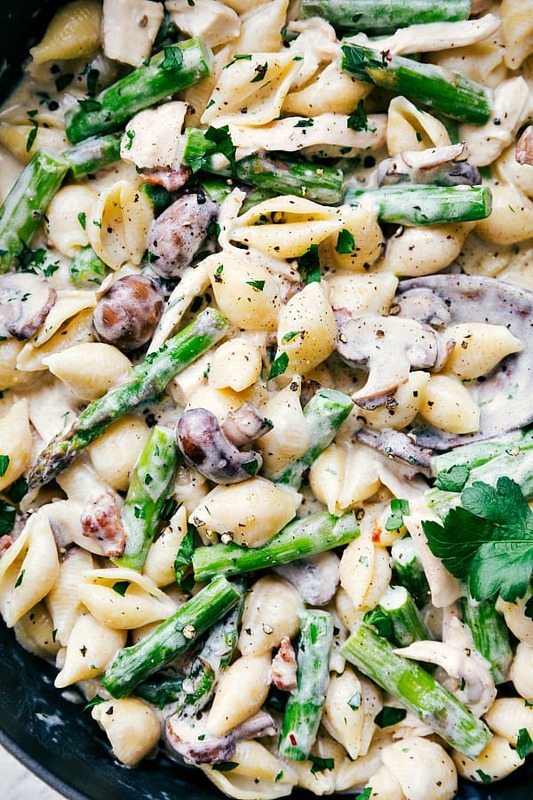 You have everything included in this tasty pasta dish. I love asparagus, especially this time of year and it was the perfect compliment to the cheesy pasta. You then get your protein from the chicken and add some mushrooms. The bacon just makes it that much better and adds fantastic flavor to the recipe. I used two different types of cheese in this recipe but mozzarella was the star. You will not find a better creamy and cheesy sauce than this one my friends. 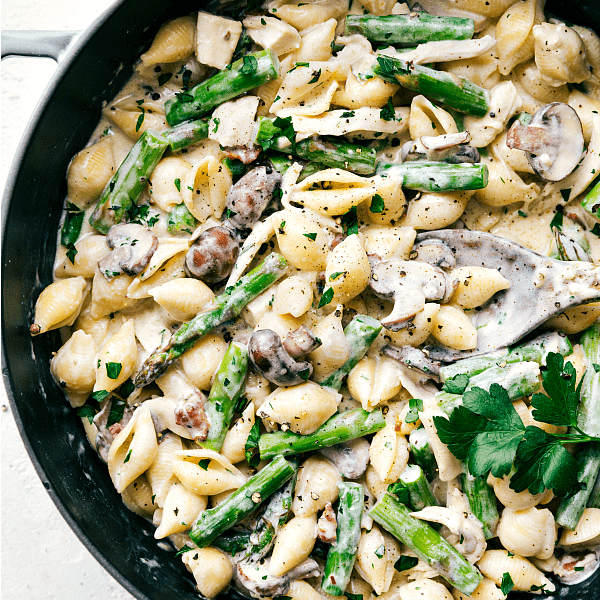 The cheese helps to thicken it up and makes it so ooey gooey delicious on top of this pasta. I then added parmesan cheese and it completed the sauce perfectly and made it so rich and delicious. I love easy meals that come together and taste like they came out of a restaurant. This meal has something that everyone is going to love but my family especially raved about the cheesy sauce. It didn’t last long at our dinner table. This is a family friendly meal that everyone is going to beg for you to make again and again! Cook the shells according to package directions. Drain and set aside. Meanwhile, chop the (uncooked) bacon into small pieces. Trim the ends of the asparagus and cut into 2 inch pieces. Add the bacon pieces to a skillet and cook for 3-4 minutes over medium high heat. 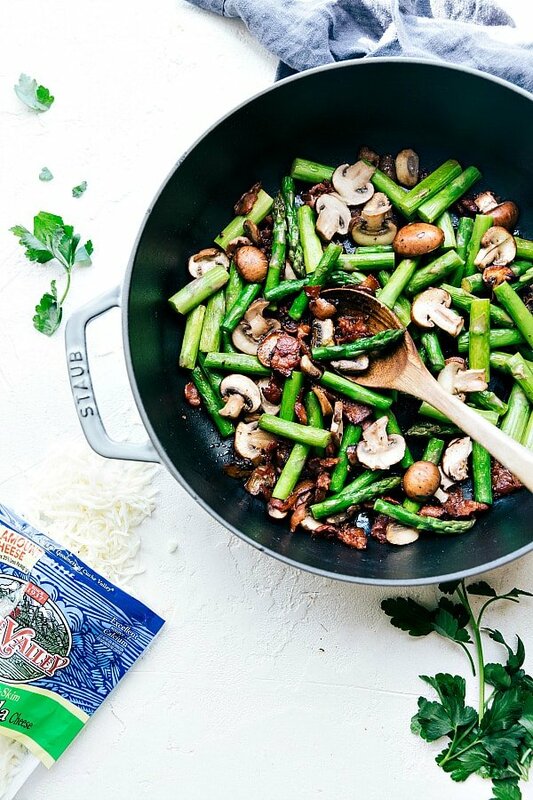 Add the asparagus and mushrooms and continue to cook until the veggies are crisp tender and bacon is cooked through. (For crispier bacon, cook the bacon alone for longer without adding in the veggies). In the same pot you used to cook the shells in (saving dishes! ), place the heat at medium low and add in the butter and olive oil. When the butter is melted add in the garlic, heavy cream, and white pepper. Bring the mixture to a simmer stirring frequently. Add in the Parmesan cheese and dried parsley. Simmer the sauce for about 9-11 minutes or until the sauce is smooth and thickened. When the sauce has become thickened, add in the grated mozzarella cheese and stir constantly until smooth. Add the cooked pasta and shredded rotisserie chicken to the bacon and asparagus skillet. Pour the cream sauce over and toss to combine. If needed thin the cream mixture with a little milk. Add fresh parsley, red pepper flakes, and additional parmesan as desired. This Post was Sponsored by Cache Valley Cheese. I love working with brands that I am passionate about and use in the kitchen for myself. All opinions expressed are my own. Cache Valley dairy products are sold at major retailers throughout Utah, including Smith’s and Walmart. It is sold in other markets in the mountain states such as Fresh Market, Ridley’s, Harmons, Macey’s, Dan’s, Broulims, Red Apple, Reynolds, Clarks. Rancho Market, Ream’s and more. Maybe try a fat free half n half? Looks yummy, but my husband hates parmesian cheese. What can I substitute? This dish was fantastic! Took a little longer than 30 minutes, probably closer to 45. I followed the recipe, only editing it by doubling the bacon, because, you know….bacon. We have one family member who is very picky (doesn’t like cheese or pasta) and they even gave it a thumbs up. Will certainly make this again, thanks for sharing! Dinner was quick and easy with ingredients I had on hand. Husband was impressed. Four and two year olds did well with it. I made this recipe hoping it would be good. I was very disappointed. It had no flavor, the sauce did not get thick, the mozzarella was stuck to the bottom of pan, the sauce did not simmer on med/low. Im also comparing this to carbonara which i make frequently and i cook a lot. You cannot go by some internet recipe and hope its going to be good. Also, putting garlic in the cream without sauteing first equals no garlic flavor. Im speechless at how bad this came out. I am sorry to hear that your recipe turned out so poorly! I understand, not all recipes will work well for everyone! Thanks for commenting and sharing your experience. My 16 year old daughter and I made this tonight for dinner. Super yummy! She even went back for seconds. This was delicious. I omitted the mushrooms and added lemon pepper, onion powder with red pepper flakes. I also used 1/2 cup Parmesan cheese, 1/2 cup pecorino Romano cheese & 1/2 cup mozzarella. Other than that I followed the directions. Will definitely be making this again. Made this tonight, it was amazing. My son hates mushroom and loved it (picking out the mushrooms of course), even went back for seconds. I used regular boneless chicken breasts (pan fried with about a tablespoon of unsalted butter) and penne instead of shells, otherwise stuck to the recipe. Will definitely be a repeat! This was fantastic! Its going into my regular dinner rotation. I can’t wait to have the lunch leftovers tomorrow. I stayed pretty true to the original recipe and it came out amazing. My personal changes… I didn’t add the chicken because I knew there would be leftovers and I don’t like the way reheated chicken tastes. Another commentor had said the garlic needs to sauté to release its garlicy goodness. I agree, so I sautéed the garlic in the butter before adding the olive oil and cream. I may have also gotten a little carried away with the cheese… It wasn’t bad, everyone loves cheese, but I probably should have stuck to the recipe’s measurements. All in all, a fantastic recipe! First off, I love this site. I was feeling bored with my usual recipes and I’ve found many new good ideas to try here that sound amazing. I made this tonight for three adults. I saw one user report the sauce was bad, but mine turned out amazing even though I don’t have access to Cache Valley Cheeses. I’ve never made a sauce like this before so I was extra careful with the heat. I even removed it from heat as I added the last ingredient, the mozzarella. I did have to thin it out with about a cup and half of water, but the sauce would make an awesome fondue for vegetables or bread on it’s own. The only thing I noticed was that the mushrooms in the picture were quite a bit smaller than the ones I bought and the shells appeared smaller as well, but it turned out very well. Everyone was happy & I served it with garlic bread. Can’t wait to try more from Recipe Critic. Thanks!